"If I had to go back in Hollywood history and name two people who were most desperately and passionately in love with each other, I would say Frank Sinatra and Ava Gardner were It," said columnist Liz Smith. It began in Hollywood's golden age when Ava was emerging as a movie star. But she fell in (and out of) love too easily. Mickey Rooney married her because he wanted another conquest. Artie Shaw treated her like a dumb brunette, giving her a reading list on their honeymoon. Neither marriage lasted a year. Then, after being courted by Howard Hughes and numerous others, along came Frank Sinatra. His passion for Ava destroyed his marriage and brought him close to ruin. 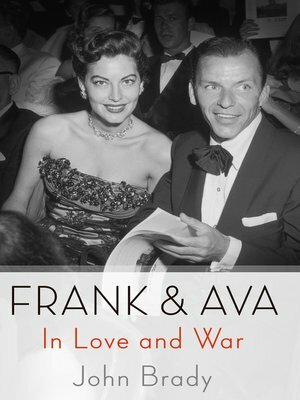 Their wild affair broke all the rules of the prudish era as Frank left his wife and children and pursued Ava on an international stage. They became romantic renegades, with the press following them from location to location. "Oh, God, Frank Sinatra could be the sweetest, most charming man in the world when he was in the mood," said Ava. They married, but then came the quarrels, separations, infidelities, and reconciliations. Eventually, there was a divorce, and they thought it was over. It wasn't. Through all of the tortured years of separation and splintered affairs with others, they maintained a secretive relationship known only to those who recognized that this was the love of a lifetime. Over the years they attempted to reconcile, romanced and nurtured each other, right to the end. The love story of Frank and Ava has never been fully explored or explained - until now. John Brady's Frank & Ava delves deeply into the lives of these two iconic stars and their turbulent lifelong relationship. More than anything else, this is the story of a romance lived out under battlefield conditions.